We’ve written often about the state of Washington’s efforts to clear tens of thousands of fish passage barriers, as well as forest landowners’ leading role in clearing the barriers over the last 20 years. Now none other than the U.S. Supreme Court is taking up some of the legal questions behind the effort. What is the state responsible for in clearing the barriers? What are the state’s obligations under its treaties with Native American tribes? Washington Attorney General argues to the Supreme Court that an earlier federal ruling would put the state on the hook for billions of dollars in fish culvert replacements, and that isn’t reasonable. The tribes, meanwhile, say that fixing the culverts is part of the state’s obligation to protect fish habitat that was affirmed under a previous Supreme Court decision in the 1970s. The Supreme Court heard oral arguments in the case in April and is expected to issue a ruling this month. Mark Doumit, executive director of the Washington Forest Protection Association, wrote this week in the Everett Herald about the lessons that forest landowners learned over 20 years of clearing more than 7,000 fish passage barriers in Washington, and how those lessons relate to the Supreme Court case. Below is Mark’s op-ed in full. Private forestland owners have been steadily fixing fish-blocking culverts, showing it can be done. Salmon recovery is in the news again, with Washington tribes and the federal government recently appearing before the U.S. Supreme Court over whether the state should be required to replace road culverts that block salmon passage. Many people don’t realize that efforts to restore salmon runs, and especially fix road culverts, have been going on in Washington’s forests nearly 20 years, and we already have a good idea of what works. As a fisherman, this is a very important issue to me and my family. 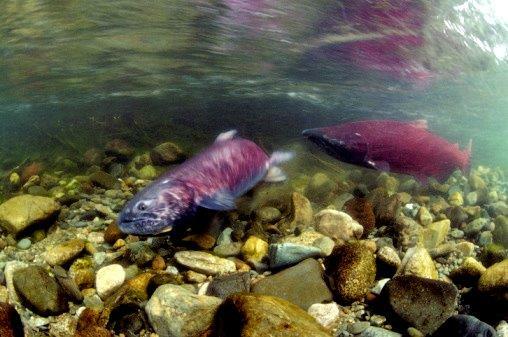 As a former lawmaker who worked with others on passage of the 1999 Forests & Fish Law to improve conditions for salmon in the forest, I know there is backstory often untold. The Forests & Fish Law was part of Washington’s Statewide Strategy to Recover Salmon, which protects all aspects of the salmon’s life cycle. This integrated, holistic approach to stewardship is the best way to rebuild sustainable salmon populations. As part of the Forests & Fish Law, forest landowners in Washington — both private landowners (which I represent) and public forestland managers — have removed 7,300 fish passage barriers since 2001 across 9.3 million acres. These landowners have spent $313 million opening up 5,100 miles of fish habitat. Private and public forest landowners have completed 84 percent of their goals and are on track to clear all the fish passage barriers in forested streams by 2021. Take bites out of the apple: Replacing hundreds or thousands of expensive road culverts may seem daunting or even impossible, but Washington forest landowners accomplished the task by tackling the issue bit-by-bit, road-by-road, over nearly 20 years. We were encouraged when the fish would return after new culverts were built, and eventually the thousands of culverts we needed to fix dwindled down to hundreds, and the end of our project is now near. New road culverts help not just fish: It’s expensive to fix even one road culvert, but we quickly found that installing better culverts helps make our logging roads safer and easier to maintain, especially during heavy rainfall. Collaboration is better than confrontation: Washington forest landowners have fixed the thousands of culverts as part of the Forests & Fish Law, a historic agreement between federal, state, tribal and county governments and private forest landowners. All of the parties agreed on a set of forest practices that protect 60,000 miles of streams running through 9.3 million acres of state and private forestland. We sat at the table on an agreement that is paying dividends for the environment and keeping all the parties out of court. Salmon are worth saving: Salmon are an integral part of Washington’s culture, spirit and identity; it is our collective responsibility to protect them. And yet the number of salmon in Washington continues to decline. There are many reasons for this decline, but improving water quality and fixing the tens of thousands of fish-blocking culverts in Washington are part of the solution. These are problems we know how to solve and are important steps in improving the health of one of our state’s most precious natural resources. While we have made a lot of progress in fixing fish passage barriers, we need to address all the major habitat factors affecting salmon. We have a shared responsibility to address the health of our salmon and waterways, and collaboration is the best way to ensure our success. Mark Doumit is executive director of the Olympia-based Washington Forest Protection Association, which represents private forest landowners growing and harvesting trees on about 4 million acres in Washington state.